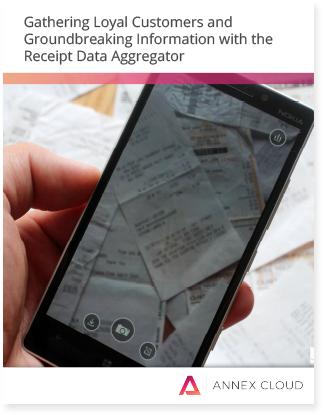 Find out how the Receipt Data Aggregator works to create convenience for both brands and shoppers. Examine the business case for this low-cost, high-impact way of spreading the word about your company. Get the business case of this completely new customer loyalty solution. Working through retailers has been a constant challenge for brands for a number of reasons. While retail partners unarguably expand your distribution, they also lower product margins and facilitate a distinct separation between you and your customers. Consequently, gathering valuable customer data and fostering loyalty can be major obstacles. The Receipt Data Aggregator changes all that. Read our white paper to find out how it uses cutting-edge technology to gather groundbreaking amount of data, bolstering customer loyalty in the process.